This tutorial uses the sample sales dataset. 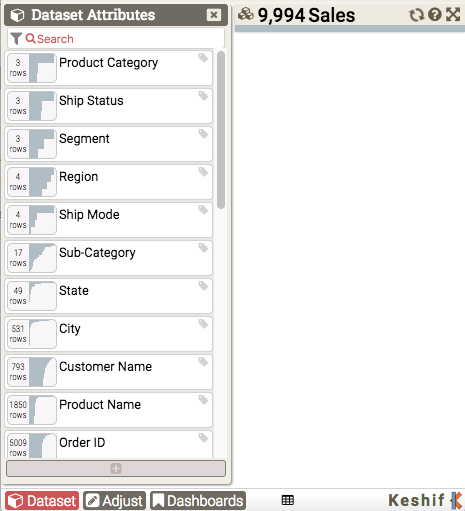 You can import any tabular data, such as a spreadsheet or CSV file. The left-most dataset panel shows all the data attributes, with their name, data type, and small overview. To insert an attribute into your dashboard, you can double-click it. You can adjust the dashboard layout by dragging the attribute title into a different panel and position (drag order date), or insert an attribute by dragging it from the dataset panel into the dashboard. You can minimize individual attributes to save some space. If you are no longer exploring a specific attribute, you can remove it, and it will appear back at the dataset panel. To be able to remove a summary from dashboard, you need to have dataset panel, or be in adjust mode. To see each record (or sales) in your dataset, drop an attribute into the middle record display panel. This will list records by product name, the attribute we selected, and you can sort the list by a numeric or time attribute in your data. 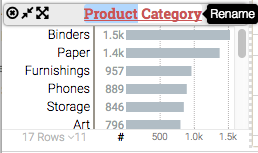 Keshif also automatically visualizes the sorting column data. To close the dataset panel, click the dataset button below. You can adjust your dashboard layout and settings, such as panel/category width or summary (attribute) names using the adjust mode, which you can enable using the lower-left "Adjust" button in the dashboard. While in adjust mode, you will not be able to select your data (highlight, filter, or compare) in charts. 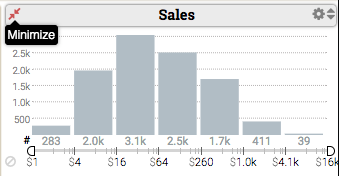 To adjust category or panel width, move your mouse over to the chart area. Guide lines that will help you make the adjustment by dragging. You can also rename your attributes, so you that you have the most appropriate titles in your dashboard. Similarly, you can also rename your categories in the dashboard as well.